Making mincemeat is really easy and yet gives you a real sense of satisfaction that you have made something really delicious that speaks of Christmas. Christmas can be a really busy time but taking an hour to chop (not too much I promise!) and mix and simmer is just what we need amongst all that chaos. This recipe also stores really well so is a great way to get ahead (and feel smug!) but can also be whipped up at short notice. Mincemeat is the ideal gift for when someone calls in unexpectedly, or when you don’t want to burden someone with yet another box of roses. Mincemeat has many uses. Naturally it’s great in mince pies topped with pastry or crumble, delicious served with ice cream or adds a festive twist when spread on swiss rolls or layered in trifles. This recipe has quite a light and fruity taste compare to the darker mincemeat we might be familiar with. It’s a recipe that can be varied to your preferences but my sister who doesn’t even like mincemeat was eating it with a spoon from the saucepan! I take that as a sign that I did something right! I’ve included some notes in the recipe for substitutions and it definitely is a recipe that can handle some changes and variations. This mincemeat can be stored in sterilized jars in a cool place for up to six months. You can buy jars or use empty ones left over in your kitchen. Some ribbons and tags can really dress these up as gifts. I sterilised mine by rinsing them in boiling water but a cycle in the dishwasher at a high temperature works too. I used vegetable suet here, which makes this dairy free and vegetarian, but you could easily use beef suet or butter if you prefer. This recipe can be made gluten free by just ensuring that all your ingredients are labelled as gluten free. Some dried ingredients are made in environments that also deal with products with gluten and some alcohols contain gluten so it’s worth being extra safe. I hope you enjoy this recipe. I would love to hear your feedback! 1 teaspoon of nutmeg, freshly grated if you can! Essentially you can use any dried fruits that you like, but just keep the weights the same. For example you could add dried tropical fruits or currants if that’s what you like. 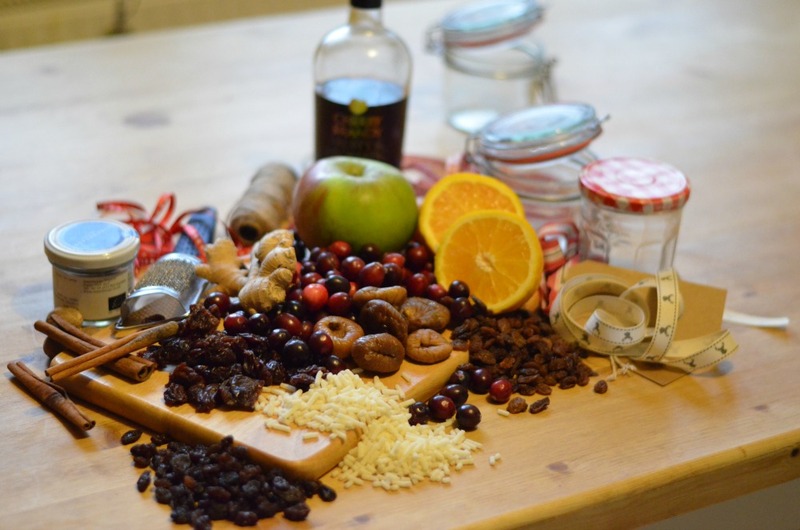 Use any brandy you like, or you could even mix in an orange liqueur or whisky for a different twist. I don’t add nuts because I prefer to add them when I am baking with mincemeat, but chopped nuts can be a lovely addition. 1. Place all the ingredients except the brandy in a saucepan and mix over a low heat until the butter or suet starts to melt. 2. Turn up to a medium heat and let it simmer for about 20 minutes until the fruit looks shiny and plumped up. If there isn’t enough juice coming from the fruit add about 50 mls of hot water or the juice of half an orange. It might look very liquid but all the dried fruit will soak it up. 4. Store in jars or use straight away. 5. It can look a little cloudy in the jars but this is just the fat setting hard once it has cooled down. I used this mincemeat recipe in my Crumble Mincepies! , orange, preserves edible gifts, spices, suet.